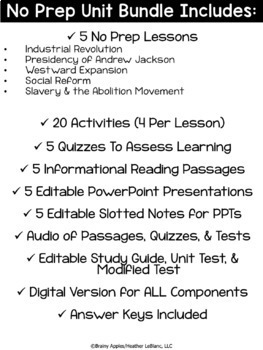 Social Reform Movements of the 19th Century No Prep Lesson: PowerPoint, Reading Passage, Activities, QuizThis resource pack is a no prep complete lesson (GOOGLE version included!) about the many social reform movements that happened during the early 19th century that includes 3-5 days of materials. This resource pack is a no prep complete UNIT (GOOGLE version included!) about the Constitution & A New Nation that includes 4-5 weeks of materials. 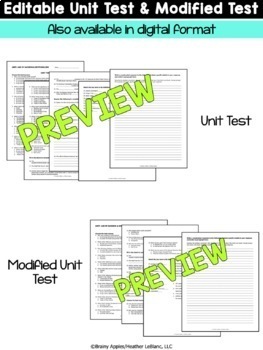 There are 5 complete lessons, an editable study guide, editable unit test (GOOGLE version included! ), & editable modified unit test (GOOGLE version included!) included in this bundle. I will be adding an audio of each passage soon! You will save over 25% by purchasing the bundle. Looking for complimentary resources that align with this unit? 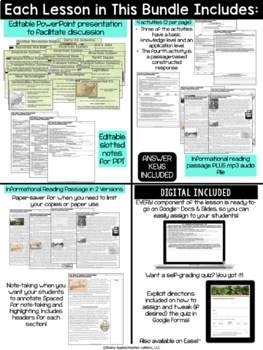 • 5 slotted notes pages so students can focus on recording the important information from the PowerPoint presentation Editable slotted notes included! Simply give students the reading passage, and they can complete the activities independently. All information needed for the activities is contained in the reading passage! These can also be used for homework. These lessons require ZERO prep for substitute plans. Students can easily check their own answers with the included answer keys.